Puri : On the special occasion of Valentine's Day, the Odisha's Puri beach has turned into a beautiful tourist spot. Famous sand artist Manas Sahoo created an art on the beach and named it as selfie point giving it a different flavour. In the form of sand art, the artist wrote 'I love India' with an expectation of people across the country visiting the place. 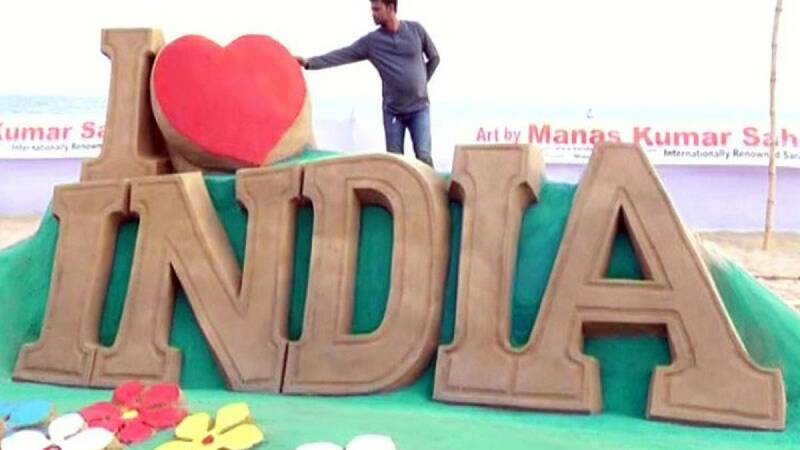 The sand artist has created the art to convey the message of love for the nation. The art is built with 25 tonnes of sand and is 17" feet in width. It took at least 30 hours for Sahoo and the students to complete it.